On the hunt for Himalayan fare? Check out the Mom's Momo food truck, which opened up last year. It's stationed at 138 E. 14th St. (between Fourth Avenue and Irving Place) near Manhattan's Union Square during the week and in Jackson Heights on the weekends, per Forbes. As the name suggests, the truck specializes in the steamed Tibetan dumplings called momo. Chef Takpa Thokme is serving up beef, chicken and veggie dumplings lashed with spicy sauce and a side of vegetables. Diners can also ask for the Tibetan wrap, with dumpling fillings and cheese wrapped in a tortilla and grilled. Beverage options include tsampa (a barley drink) and mango or peach lassi. The food truck has proven popular thus far, with a 4.5-star rating out of five reviews on Yelp. "It is a family business and the people are nice and kind. 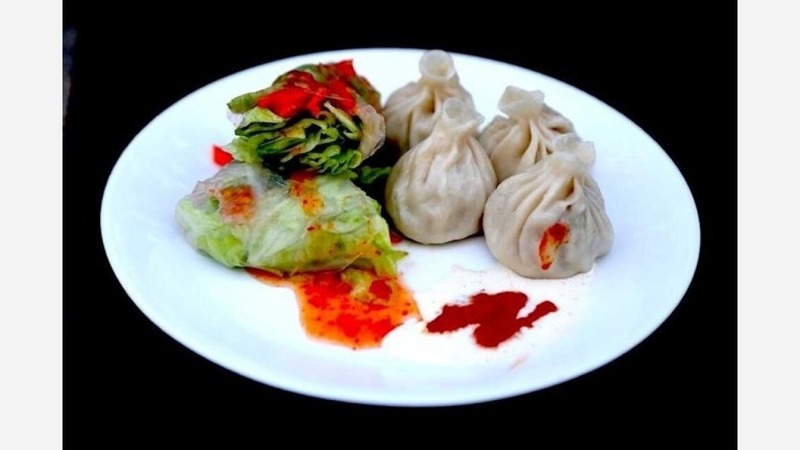 They serve one of the most authentic Tibetan momo I have ever had in NYC," said Yelper Dolma Y. "They also have laping! If you are craving Tibetan momo that tastes very different from other dumplings, this is the place to go!" Angeline P. agreed, "This is an excellent momo! Their beef momo is a little on the saltier side, and their dough is a bit thicker than Amdo's, making it chewier but also more likely to survive the walk home."